Family Law Attorneys Reston & Northern VA - Melone Law | Melone Law, P.C. When going through a separation, divorce, or custody dispute, the added stress of figuring out the legal system can only negatively impact your case. Whether you have a relatively straightforward case or need extensive litigation to resolve your domestic relations dispute, an attorney can help you navigate the legal system to find workable solutions. 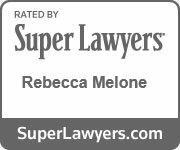 Attorney Rebecca Melone can give you a clear understanding of your options throughout the process and advise you of the potential outcomes. Armed with an understanding of your position and potential outcomes, you can make better decisions and find solutions that will be practical for your situation. Before initiating a divorce case, it’s important to understand the elements that will be important during the process. While going through a divorce case is rarely simple, there are things you can do to make it easier on everyone involved. Finding an attorney who will work with you whether you decide to negotiate, mediate, or litigate your case is essential. Sometimes, working together with your soon-to-be-ex spouse can be the best option for your case. Working out a Property Settlement Agreement can save you both time and expense, while allowing you both to move on with your lives. Depending on the custody, support, and equitable distribution items at issue, it can be a relatively straightforward process. Attorney Rebecca Melone handles uncontested divorce matters throughout the area on a flat fee basis and works to make sure the process is finalized as quickly as possible. No one is in a better position to understand your situation than you. The court can impose orders based on evidence presented at trial, but the judge only gets a narrow view of your situation and may not impose the best arrangement for your situation. Armed with an understanding of what could happen at trial, you can negotiate a fair deal which will be enforced by the court. If you and your soon-to-be-ex spouse have partially worked out a deal, it can be beneficial to go to mediation. It is not always plausible to resolve cases without going to court, which is why every case is thoroughly prepared from the beginning for litigation. There are only four grounds for fault-based divorce in Virginia: Adultery, Cruelty, Felony conviction, and Desertion. A thorough evaluation of your case is necessary to determine which grounds you may qualify for in your Virginia divorce. Even if the grounds of divorce are not complicated, financially complex cases often require thorough examination of marital property and other assets. There are two forms of custody: legal and physical. Legal custody means the parent has a role in making important decisions for the child. Generally, the court awards joint legal custody, even if one parent has been less involved in the child’s life. Legal custody is awarded to parents who demonstrate they are able to control, direct, and care for the child. Physical custody is the determination of who will have the child in their care more frequently. If both parties spend significant time with the child in their care, they may be awarded shared physical custody. Often the court will set living arrangements such that the child resides primarily with one parent. The other parent will receive visitation with the child. Visitation rights will be set by the court if there is a dispute and the parents cannot agree on a schedule. In determining the custody of children, the court is guided by one standard: the best interest of the child. Factors considered by the court when awarding custody may include the age of the parent and child, the physical and mental condition of each parent and child, the relationship existing between each parent and each child, the needs of the child, the role played by each parent in the upbringing and caring for the child, the home where the child will live and the child’s wishes if the child is of sufficient age, intelligence, and maturity to make such a decision. One important factor to the court in establishing most custody arrangements is which parent will be the most likely to see to it that the other parent remains a strong part of the child’s life. Both custody and visitation may be changed if there is a material change in circumstances after the court makes its order. Again, the requested change in custody will be evaluated according to the best interests of the child. The party with primary physical custody of the child will usually be the recipient of any child support award. Generally, the court follows the guideline support amount found in the statute. The guideline amount is presumed to be correct, but the court may deviate from the guidelines in appropriate circumstances. The support amount is subject to change so long as the obligation remains. It may increase or decrease if a material change occurs. Material change may include a change in income level of either parent. Non-custodial parents who have the child more than 90 days per year for visitation have support calculated using a different formula. Their support obligation will be lower. The court can also apportion tax exemptions for the children between the parties. Spousal support, or alimony, is an amount of monetary support paid to the more financially dependent spouse and is based on a number of factors, including the need for and ability to pay spousal support, and the lifestyle to which the parties became accustomed during the marriage. Section 20-107.1 of the Virginia Code governs spousal support. Spousal support is also different from property division, or “equitable distribution,” and is not designed to reimburse or punish a spouse. There are three basic types of spousal support: periodic payments for an undefined duration, periodic payments for a defined duration, and a lump sum award. A court can use any combination of the types of support. Parties may also enter into agreements that provide for different combinations of spousal support, various payment methods, and longer or shorter durations of support. They can also agree that neither spouse will have to provide support for the other. If there is a pre-existing agreement, the court will be bound by the parties decision in determining any spousal support award. If you need counsel or just some advice for a domestic relations case in northern Virginia, contact the firm online or call 703-622-1325 to schedule a consultation.